It is natural to feel degrees of panic and nervousness after an auto or truck accident but following the steps below will ensure you have met your legal obligation after a car wreck or truck wreck in Texas. If you are injured, try to stay calm. Panic will not help your injury and can actually make the symptoms worse. Help is on the way! Your primary responsibility is to stay on the scene of an accident, not only to provide needed assistance or receive needed care, but because leaving the scene is against Texas law. If you breach this law, your license could be revoked and you could face strict penalties. If you are uninjured and mobile, your first responsibility is to remove the risk that the car wreck poses to other drivers and pedestrians. You should make sure your vehicle is safely off the road and out of harm’s way. If your vehicle is immovable, do your best to warn drivers by. But always stay safe. After a Texas car or truck wreck, every party should act responsibly and follow proper legal guidelines. Now that you and hopefully all other vehicles are safely off the road, you may be faced with important decisions as well as customary legal mandates. If there are injured victims, do not hesitate to call 911 immediately. If you do not have a cellphone, try to flag down a passing vehicle and ask for assistance. A call to 911 will ensure that police and medical assistance are in route. If in doubt, call 911. Be careful in efforts to comfort and assist injured parties and take the utmost care when attempting to move any injured person. Reporting injuries to your 911 operator will ensure an ambulance and police, sheriff or highway patrol are on the way. In most cases, it is better to allow these experienced persons to administer first aid or any immediately necessary medical care. Again, if you are injured, you can best help yourself by remaining as calm as possible and assessing your injury so that you can provide a caregiver a coherent description. One way or another, make sure you or another party has called 911 for assistance. All persons directly involved in a car wreck in Texas are required to exchange information. This should occur in every auto accident, regardless of severity. It is always advisable to obtain contact information about any witnesses and to take relevant images of the accident scene, including the vehicles and roadway. This information can be especially helpful if your or the other person’s insurance carrier contests damages or attempts to reassign fault. If the driver strikes an unattended vehicle, he or she should attempt to find and notify the vehicle owner. If you locate the owner, exchange the information above. If you are unable to locate the vehicle owner, you are required to leave a note with your name and contact information and a brief summary of the accident details. In certain situations, a report may be required by the Texas Department of Transportation (DOT). This report is called the Driver’s Crash Report and must be filed within 10 days of an accident. 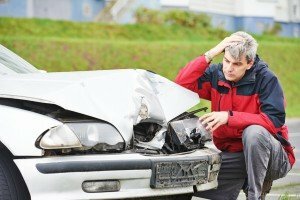 Accidents where auto damage or personal property damage is equal to or greater than $1,000. It is best to ALWAYS REQUEST A CRASH REPORT!!! The Driver’s Crash Report requires specific details about your insurance coverage. DOT will use this report to cross-check your coverage. In the event the driver did not have liability insurance at the time of the car wreck, the driver’s license may be suspended and a surcharge of $250 levied. If the police filed a report, always try to obtain a copy of the report. You are obligated to report the accident to your insurance provider but you should not discuss the case or any claim with any other carrier until you have met with an attorney. We also suggest contacting an attorney before giving any recorded statements, including statements to your own insurance company. An unintentional, confusing comment or statement can ruin your claim. In Fort Worth, the personal injury firm of Hutchison & Stoy has an enviable record representing drives, passengers and pedestrians involved in car wrecks in Texas. Call 817-820-0100 for a free case evaluation or fill out our free online case evaluation form. This could be the most important step you take after a car wreck in Texas.